My daughter’s school supplies from k12.com came today. It was a lot of fun checking out what we got from them. But one of the most interesting parts was looking at the insides of the top flaps. That’s just one of the flaps. It’s a little hard to read, but all four flaps give ideas on how you can reuse the box around the house, as a toy and more. 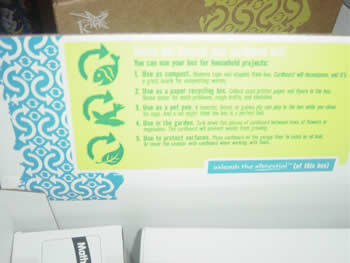 It’s really a great way for them to encourage the reuse of the box. I have to say the supplies look really great too. It’s going to be a great school year. Published by Stephanie, in Eco Friendly Parenting. Tagged with education, homeschool, homeschooling, school supplies. Hmm those boxes look awfully familiar.. eek! I’m surrounded by them! Look out! I know that feeling. My daughter’s loving it.